The Pomelo is a tart fruit available in the winter time. Also called shaddock, pumelo, pummelo, and Chinese grapefruit, pomelo is an ancestor of the grapefruit that originated in Asia but is now grown all over the world. 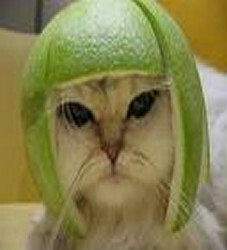 You could make a hat out of a pomelo for your cat!